By Dan Ambrose: Abel Sanchez, the trainer for IBO/WBA middleweight champion Gennady Golovkin (33-0, 30 KOs) is hoping that Golovkin can get a fight against unbeaten Floyd Mayweather Jr. (48-0, 26 KOs) next year at 154. Sanchez says that Golovkin is willing to go down to junior middleweight to make the fight happen with Mayweather, and sees there being no reason why Mayweather can’t take the fight with Golovkin, because he says Golovkin and Saul “Canelo” Alvarez are both the same size. Mayweather fought Canelo in 2013, and beat him by a 12 round decision. Canelo is actually heavier than Golovkin in coming into his fights as heavy as 175lbs compared to Golovkin’s usual 170lbs. Sanchez feels that the weight wouldn’t be a reason for Mayweather not to fight Golovkin because he already showed that he could fight a larger fighter than him in Canelo in the past. Sanchez thinks that it’s a waste of time for Mayweather to be looking to break former heavyweight world champion Rocky Marciano’s record of 49-0, because Mayweather’s record would be tainted due to the fact that he’s not fighting the level fighters to accomplish that mark. Mayweather must feel that by him finishing out his record with either a 49-0 or 50-0 record, boxing fans in the future will look back at him and see him as being the greatest fighter of all time or one of the greatest. However, Mayweather will likely be perceived in a similar way as guys like Joe Calzaghe and Carl Froch, both of which retired in their prime without fighting a number of high caliber opponents. Calzaghe retired without fighting Andre Ward, who had emerged as a real threat to him at that point in his career. Froch retired without fighting Ward [again], James DeGale and Golovkin. Calzaghe and Froch both left the sport with a lot of questions unanswered. If Mayweather retires after the Berto fight, which shapes up to be a mismatch, then it’s going to reflect badly for Mayweather because he won’t have faced Golovkin, Keith Thurman, Amir Khan, Shawn Porter, Kell Brook, Tim Bradley, or Danny Garcia. “The belt he [Mayweather] holds is at 154,” Sanchez said. “Now if he beats Golovkin there’s nothing else for him to do unless he’s going to fight [Wladimir] Klitschko. So if Golovkin wasn’t willing to go down to 154, I could understand it, but he’s [Golovkin] willing to make him at the weight where he’s a champion for two belts. Golovkin is no bigger than Canelo, and he [Mayweather] fought Canelo. Golovkin doesn’t blow up like Canelo did, and he fought Canelo. I don’t see the ‘he’s [Golovkin] not a draw.’ I think that’s something on our side too. So hopefully if that [Golovkin vs. Mayweather] happens, it will happen next year. 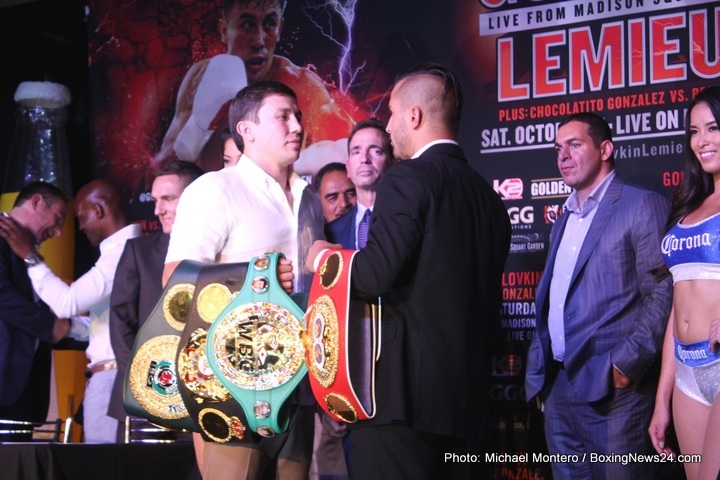 If it does, it will be a great spectacle like this [Golovkin vs. Lemieux] is starting to be,” Sanchez said. It would be very interesting if Mayweather were willing to challenge himself by facing Golovkin in 2016 at 154. It would show a lot of courage by Mayweather in taking that fight, and it would definitely be a strong way of exiting the sport. Instead of Mayweather going out on a whimper by fighting Berto or Manny Pacquiao, he would be leaving the sport with a huge bang in facing a guy with a real chance of defeating him in Golovkin. There really isn’t any reason why Mayheather can’t fight Golovkin because he is lighter than Canelo, and Mayweather did fight Canelo two years ago in 2013. The only difference in Canelo and Golovkin is the fact that Golovkin has one-punch power and Canelo has the type of power where he needs to land a lot of shots to get his opponents out. Golovkin will be facing IBF middleweight champion David Lemieux (34-2, 31 KOs) on October 17th on HBO pay-per-view at Madison Square Garden in New York.